Judi is not only one of the newer members of the ACC but a recent transplant to Ashe County. Judging by the quality of this image, she brings a great deal of photographic talent to both the Club and the County. It’s somewhat amazing how this rural, somewhat remote area manages to continue to attract so many talented newcomers. This photograph was taken at Daniel Boone Native Gardens in Boone during a recent Flower Photo Stroll led by member Bill Barbour. The yellow goat’s beard is sharply focused and the bright yellow truly stands out against the dark green, softly diffused background. There are no elements included that detract from the main focal point. Shifting the image off center to the right is simply the best approach. Congratulations to Judi for having the courage as a new member to step forward and share her work with everyone. This entry was posted in Nature, Watauga County and tagged Canon, flowers, Judi Brown on June 14, 2013 by GAR. You can tell where the subject is – no doubt! But, the supporting cast in the background is busy promoting, quietly and gently. Nicely worked out and perfectly cropped. Great sharp shot with plenty of color, contrast & detail. Welcome to ACC and thanks for sharing a super shot. There are a lot of close-up and macro aficianado’s in ACC, so keep em coming ! Grocho Marx once said “Outside of a dog, a book is man’s best friend. Inside of a dog, its too dark to read a book.” Yazza ! 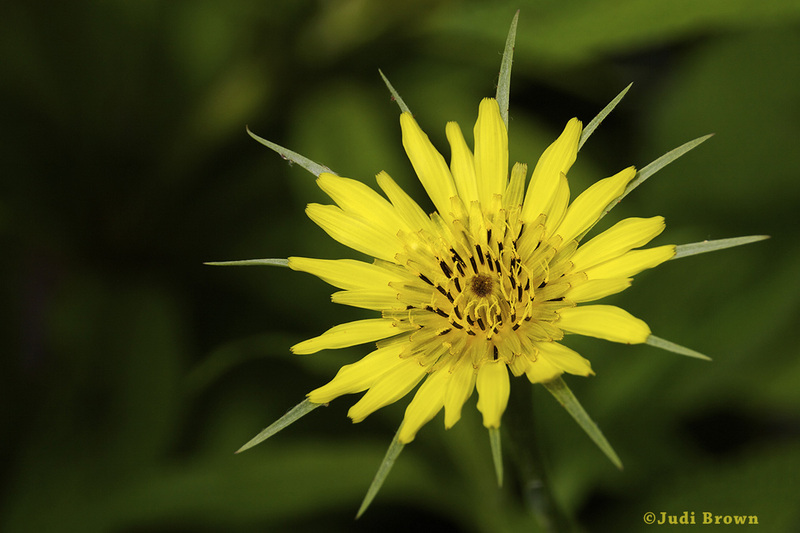 The flower is tack-sharp and the yellow is perfect. Really beautiful. Great shot, Judi! Our family has long benefitted from Judi’s photography skills. So glad she is sharing them more broadly. Fabulous photo … lovely. Hope to see many more.